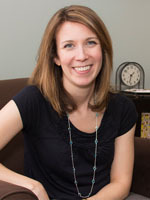 Dr. Sayrs received her Bachelor’s degree at the University of Washington and her PhD at the University of Nevada, Reno, where she studied dialectical behavior therapy (DBT) and behavioral theory. She then served as a postdoctoral fellow with Dr. Marsha Linehan at the University of Washington, where she was the clinical coordinator for Dr. Linehan’s DBT research clinic. She has served as a research therapist on three DBT clinical trials and as DBT adherence coder on several trials. Dr. Sayrs is a trainer for Behavioral Tech, providing a wide range of DBT workshops in the US, Canada, United Kingdom, and Australia. She also works with Radically Open DBT (RO-DBT), an expansion of DBT aimed at problems of over-control, such as chronic depression. She is also the Director of the DBT Center at EBTCS, where she provides DBT to adults, adolescents, and couples. Dr. Sayrs also has extensive training and experience in treating anxiety disorders, including generalized anxiety disorder, social phobia, panic disorder, and posttraumatic stress disorder (PTSD), and obsessive-compulsive disorder (OCD). She also treats depression, substance dependence, body dysmorphic disorder, and body-focused repetitive disorders (hair pulling, skin-picking). She is a graduate of the International OCD Foundation’s Behavior Therapy Training Institute (BTTI).